Corn and Green Chile Dip – the sweet, salty and spicy flavors of Mexican street corn come together in this delicious dip. Perfect for your next party, game day or snack anytime. Corn on the cob is a favorite at my house. I’ve mentioned that whenever I make it, I like to prepare a few extra ears of corn so that I have leftovers to be used in salads, such as my Tomato Corn and Black Bean Salad. 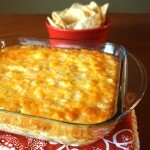 Or, in other dishes such as this Corn and Green Chile Dip. This past weekend I had three ears of leftover corn to use up. I also had some fresh green chilies that my neighbors’ had given me from their garden. So, I decided to make a dip incorporating the flavors of Mexican street corn. Mexican street corn is grilled corn on the cob that has been slathered in mayonnaise and rolled in cotija cheese and topped with a squeeze of lime juice and a sprinkle of chili powder. 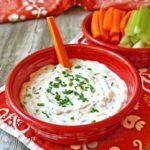 I thought these flavors would go nicely in a dip and that certainly is the case. I charred the corn and green chili (the chili can also be roasted, and skin removed, prior to charring). Then, I tossed them along with some green onions in a creamy mayo based dressing with garlic, lime juice and fresh cilantro. Finally, I folded in some crumbled feta cheese (a substitute for the cotija). The resulting Corn and Green Chile Dip is so delicious and full of sweet, salty and spicy flavors. Both my in-laws and my parents were visiting us for the Labor Day holiday weekend. 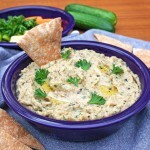 I served this dip, along with some tortilla chips, as a Sunday afternoon snack. It was a big hit and gone in no time. 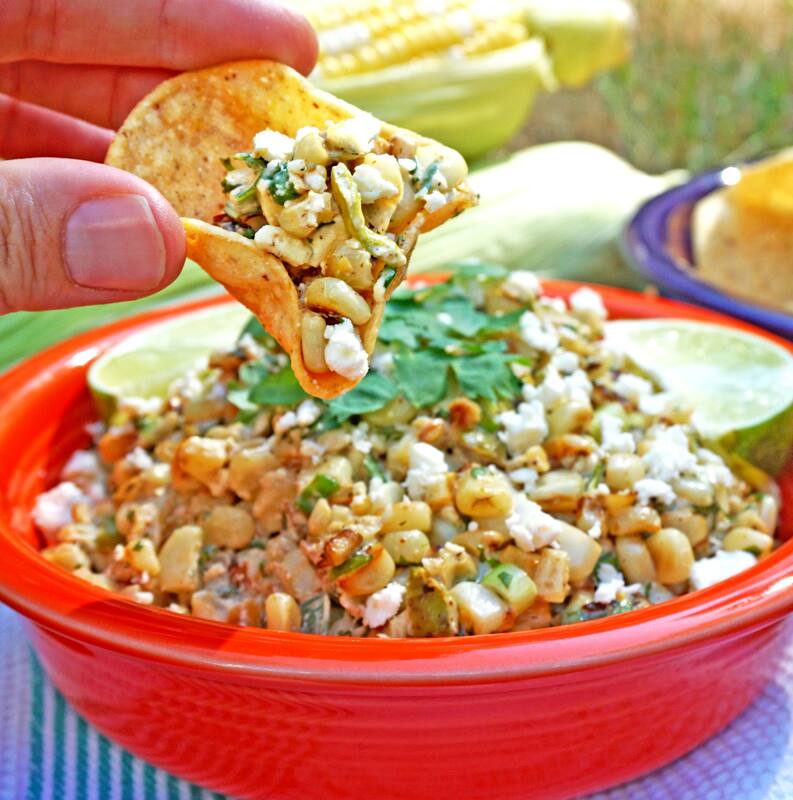 This delicious Corn and Green Chile Dip along with some tortilla chips is a great addition to a party, game day or snacktime anytime. 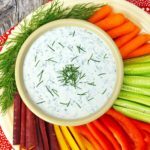 This flavorful dip is also wonderful as a side dish for a barbeque or taco night. Corn and Green Chile Dip -- the sweet, salty and spicy flavors of Mexican street corn in a delicious dip. Perfect for your next party, game day or snack anytime. Add corn to skillet and let it develop a char, stirring occasionally, cooking about 4 minutes. Add green chile to skillet and cook for an additional 1 minute, stirring occasionally. Remove skillet from heat. Transfer corn mixture to a medium sized mixing bowl. Add sliced green onions to corn mixture. In a small sized mixing bowl, whisk together mayonnaise, cilantro, garlic and lime juice to make a dressing. Pour dressing over corn mixture and toss to combine. Add feta or cotija cheese to corn mixture, using a spatula fold cheese into mixture to combine. Sprinkle chili powder over corn mixture, mixing with spatula to combine. 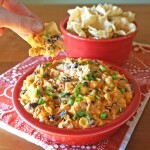 Serve dip with tortilla chips, or on its own as a side dish. The green chile can be roasted first, and skin removed, prior to charring. This entry was posted in Appetizers & Small Bites, Dips & Spreads, Salads & Sides, Vegetarian and tagged appetizer, corn, dip, fall, green chile, mexican corn, mexican street corn, party, side dish, summer. Wow, what a yummy combination…I love the taste of feta in any kind of salad or dip! Thanks for joining us on Oh My Heartsie Girl Wordless Wednesday! Serious yum! This is right up my alley! I’ll be making this soon, Joy! This is the greatest chile dip recipe I have ever seen. Great job, Joy. Perfection and the epitome of a fun summer appetizer! 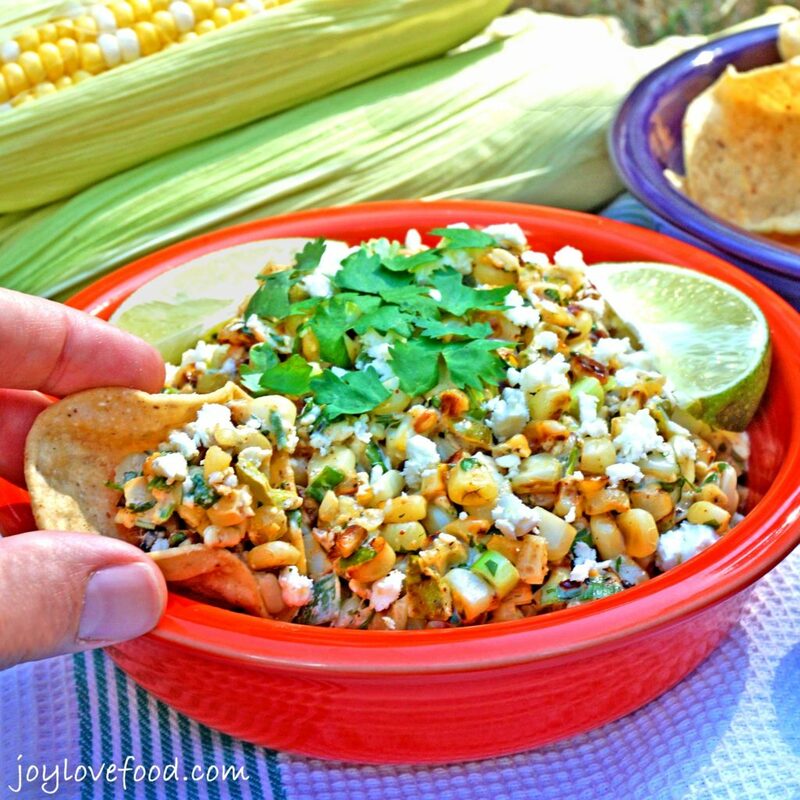 I love the green chile in this, and there’s no denying how amazing Mexican street corn is! Great dish! I can tell you that that bowl would be gone in a flash around here on game days! My boys would gobble that right up! Looks amazing, another fantastic recipe! Yummy, this sounds so good! Thanks so much for visiting and for taking the time to leave such a kind comment! Debbie-Dabble recently posted…How to Make Toilet Paper Pumpkins!! Sarah Eliza recently posted…How to Find Your Style – Minimalist Style for the Rest of Us – Step 1 in Transitioning Towards a Capsule Wardrobe Without Losing Your Mind! Hi Sarah Eliza, I love corn in dips too, thanks so much for coming by! Yum! Sweet corn and spicy chile together. This sounds good. Have a great weekend, Joy. 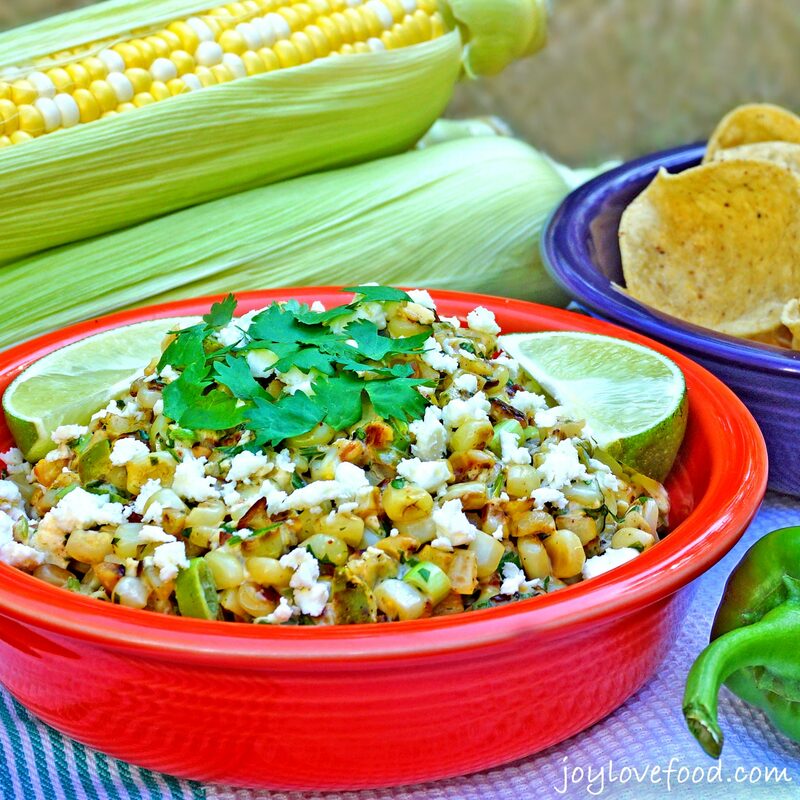 Thanks Linda, sweet corn and green chiles are indeed so good together, hope you have a wonderful weekend!